Good product for a very active dog. The Seresto collars work great! This product is very easy to install and didn't bother my dog at all! It's cleaner than the other flea & tick products. This product was easy to use. So far I really like the Soresto collar. 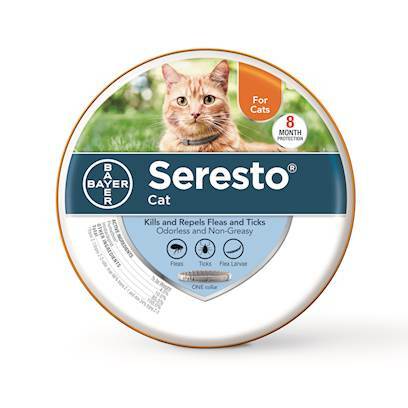 I would recommend this product, I have used it on my cats and it works....no fleas. So far the product has been working. I like the ease of use as opposed to applying product every month. I was really hoping this product would work for a while but my Ziggy is already itching. Love the way it protects dog. IT HAS HELPED, BUT I WAS TOLD THE TICKS WOULD NOT GET ON THEM. Knock wood......so far, so good. Overall good but it was a heavy tick year. convenience is the best part of the product. I love the 8 months of coverage. Value and Results exceed Expectations! I would recommend this collar to anyone! It is effective and easy! I was, at first, not sure it would be as effective as it actually is. I have not seen any fleas or ticks. Wonderful product! No Flea or Tick problems here. Works great - took a few weeks to be flea-free. This product did not keep ticks off my inside dog's. Works well and simple to use. Seems to work even after getting swimming all summer. This product has good qualities. Only thing that works for our dog. Worry Free for 8 months! !